Retinitis pigmentosa (RP) is a retinal degenerative disease that is characterized by depletion of rod photoreceptors followed by the loss of cone cells. The majority of RP-associated mutations are in genes encoding rod-specific proteins, and the distinct progression of this disease suggests that rod function is required for cone photoreceptor maintenance. Rod-derived cone viability factor is generated as two distinct isoforms; RdCVF, a truncated form that promotes cone survival, and RdCVFL, which has oxioreductase activity; however, the specific functions of these proteins in the retina are not clear. Leah Byrne and colleagues at University of California Berkeley used adeno-associated virus-mediated (AAV-mediated) approaches to evaluate the specific effects of RdCVFL and RdCVF in murine RP models. Both systemic and intravitreal delivery of RdCVF rescued cone photoreceptors in RP mice, but did not restore rod cells. In contrast, RdCVFL expression early in the course of disease prolonged rod function and decreased cellular oxidative stress, but did not have any protective effect on cone cells. The results from this study demonstrate that the 2 isoforms of rod-derived cone viability factor differentially protect photoreceptors and suggest that RdCVF gene therapy has potential for prolonging vision in retinal degenerative diseases. 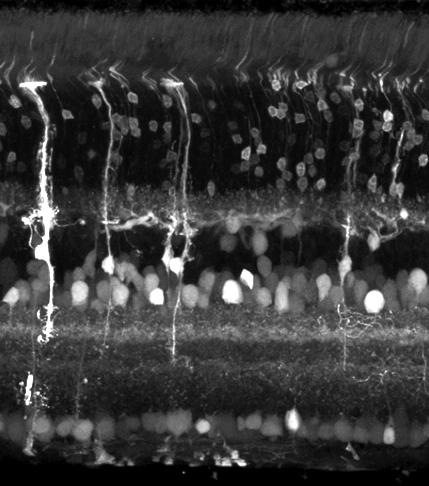 The accompanying image shows a retinal section from a WT mouse following systemic delivery of a control GFP-expressing AAV vector, demonstrating delivery of the vector to multiple cells within the layers of the retina. Citation Information: J Clin Invest. 2015;125(1):105-116. https://doi.org/10.1172/JCI65654. Alternative splicing of nucleoredoxin-like 1 (Nxnl1) results in 2 isoforms of the rod-derived cone viability factor. The truncated form (RdCVF) is a thioredoxin-like protein secreted by rods that promotes cone survival, while the full-length isoform (RdCVFL), which contains a thioredoxin fold, is involved in oxidative signaling and protection against hyperoxia. Here, we evaluated the effects of these different isoforms in 2 murine models of rod-cone dystrophy. We used adeno-associated virus (AAV) to express these isoforms in mice and found that both systemic and intravitreal injection of engineered AAV vectors resulted in RdCVF and RdCVFL expression in the eye. Systemic delivery of AAV92YF vectors in neonates resulted in earlier onset of RdCVF and RdCVFL expression compared with that observed with intraocular injection using the same vectors at P14. We also evaluated the efficacy of intravitreal injection using a recently developed photoreceptor-transducing AAV variant (7m8) at P14. Systemic administration of AAV92YF-RdCVF improved cone function and delayed cone loss, while AAV92YF-RdCVFL increased rhodopsin mRNA and reduced oxidative stress by-products. Intravitreal 7m8-RdCVF slowed the rate of cone cell death and increased the amplitude of the photopic electroretinogram. Together, these results indicate different functions for Nxnl1 isoforms in the retina and suggest that RdCVF gene therapy has potential for treating retinal degenerative disease.